Keep your iPhone 6/6s powered and protected from the elements when you're out in extreme conditions with the white and gray frē Power Battery Case from LifeProof. Encased in the frē Power, your iPhone is sealed from dirt, dust, snow, and ice. You can submerge it in up to 6.6' of water for up to one hour, and drop it from a height of up to 6.6' without damaging your phone. A 2600mAh battery is built into the frē Power case, ready to refuel your iPhone when it's running low. Just hit the power button, and when your device hits 100%, the frē Power automatically stops charging to preserve its energy for later. Rapid Recharge technology means it powers up quickly, and Auto-Stop Charge means it preserves its charge. The battery capacity is enough to charge your iPhone 6/6s twice. The built-in screen cover is barely detectable and guards against scratches without getting in the way. The anti-reflective optical glass camera lens turns your iPhone into an action cam, so you can document your activities in extreme conditions. A Sound Enhancement System delivers rich tone when you're listening to audio. All the buttons and controls on your iPhone, such as volume control, silent mode, and fingerprint unlock, stay fully functional. 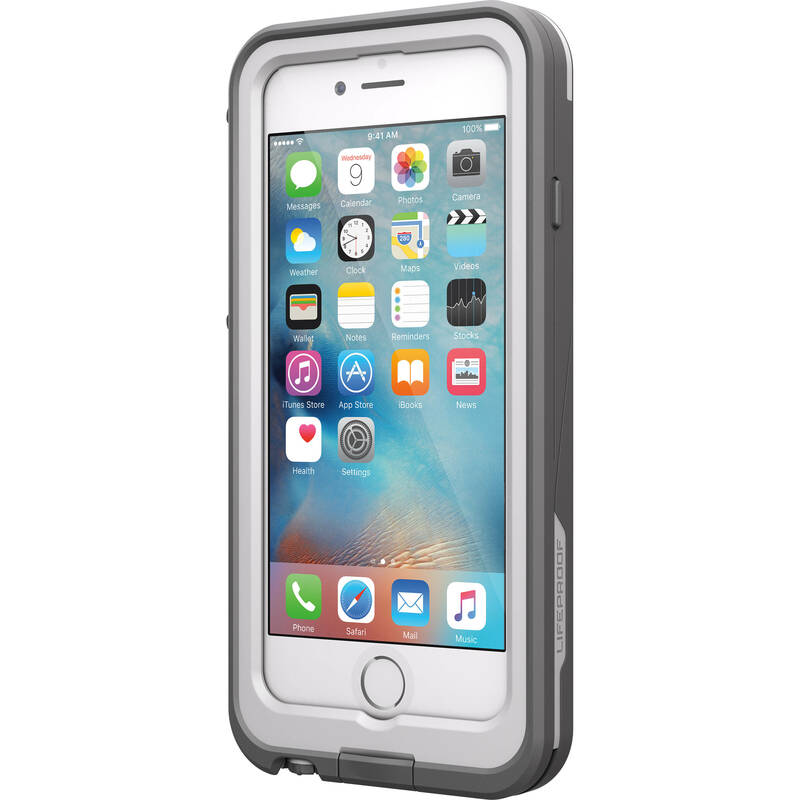 The U.S. Military Standard for drop and shock protection requires that your LifeProof case physically withstand the drops, fumbles, vibrations, and bumps you encounter day to day. 6 and 8 are the highest ratings for solids and liquids (respectively) when tested by the international standard for Ingress Protection (IP). IP68-rated cases withstand circulating talc for 8 hours and water immersion to 6.6' for 1 hour. All cases are factory water tested. Random units undergo additional inspection, including a second water test. Box Dimensions (LxWxH) 7.7 x 4.2 x 1.5"
fr? Power 2600mAh Battery Case for iPhone 6/6s (White/Gray) is rated 4.0 out of 5 by 3. Rated 2 out of 5 by Ryan Askren from Charging port is worthless I have owned two of these cases. The first had issues staying connected to the charger, I waited a few months and decided to give the cases another chance. Poor decision. Out of the box I had to rest the cable so it had pressure on the port long enough to sync my phone. Removing the entire case is the only way to ensure it will stay connected. Great idea and really useful, just one weak link though. Rated 5 out of 5 by Anonymous from Would buy this again! Great product. Waterproof and it charges - fantastic! Rated 5 out of 5 by Samuel from Happy with transaction and product! Happy with transaction and product! What is the factory warranty? I do not use in mine, but I guess it's possible.